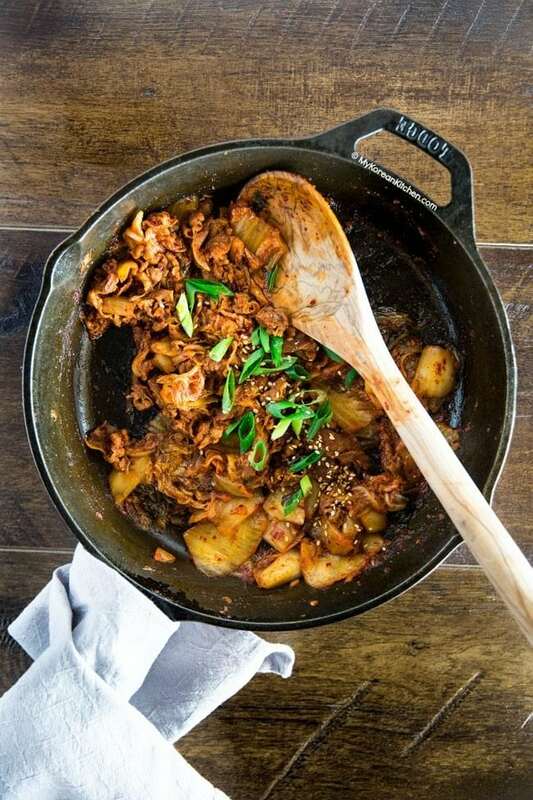 Easy Tofu Kimchi (Dubu Kimchi) recipe. Ready in 15 mins! 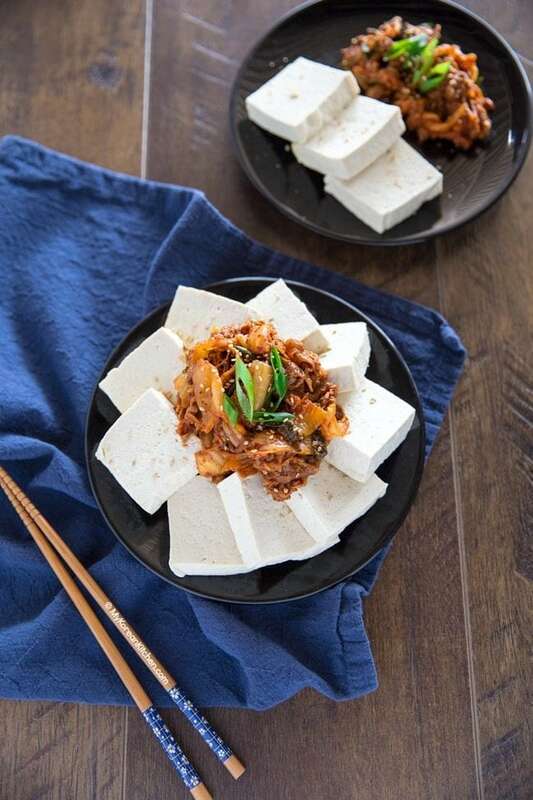 Tofu Kimchi is essentially a stir fried kimchi served with boiled tofu. They are not cooked together but rather served together. My original tofu kimchi recipe from 2006 was a vegetarian version. But, it is more commonly made with some meat, often pork, so I decided to update my old recipe to include those missing elements. 🙂 – You can still make it the vegetarian way. Though, I have to say that my husband was very happy about this update, because he loves meat! Tofu Kimchi is a popular appetiser and also a drink snack in Korea. People often associate it with Korean alcoholic beverage – Soju (소주) or Makgeolli (막걸리). But it goes very well as a side dish to your main meals! I can finish my plain steamed rice just with this! What I love about tofu kimchi is that they complement each other very well. Tofu is mild, and kimchi has a complex spicy flavour. These complex flavours are even more enhanced by cooking with meat and nutty aromas from sesame oil, and sesame seeds are marvellous! It will make you content and happy. 🙂 I hope you give this a try soon! P.S. 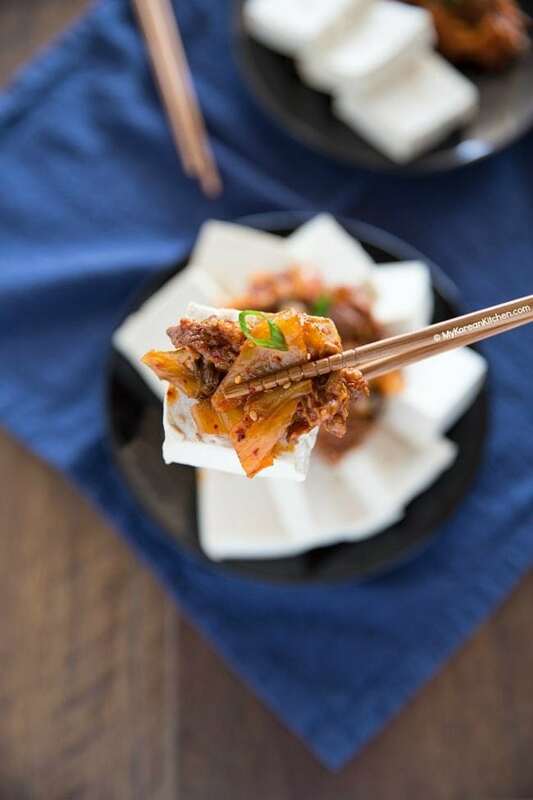 Check out more easy recipes using kimchi! Also, if you love tofu, check out my pan fried Korean tofu recipe! 1. In a well heated skillet/wok, add some cooking oil. Add the marinated meat and cook it on medium high heat until about 70% of the meat is cooked (3 to 5 mins). Add the kimchi and sugar and stir them well until the kimchi is fully cooked and tender (3 to 5 mins). Add the sesame oil, sesame seeds, and green onion and stir quickly. Remove from the heat. 2. (Ideally, this step should start at the same time as step 1). Boil some water in a pot (enough to cover the tofu) and once the water is rolling boiling, add the tofu and cook it for 2 to 3 mins. Drain the water and thinly slice the tofu ( about 5 cm x 5 cm /2 inch x 2 inch). Watch out for hot steam or hot tofu while slicing. Tip: If you have a clean linen cloth (e.g. 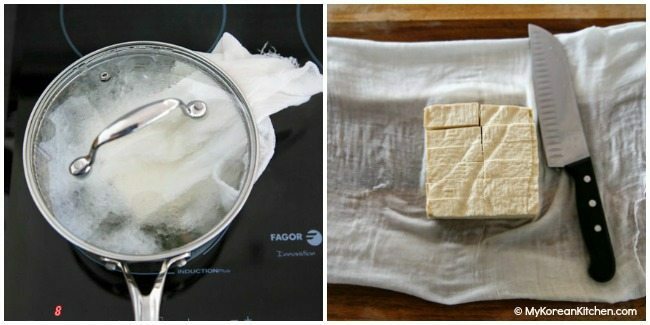 cheese cloth), wrap up the tofu with it before boiling. Then it’s easy to take it out while keeping the tofu shape in place. 3. 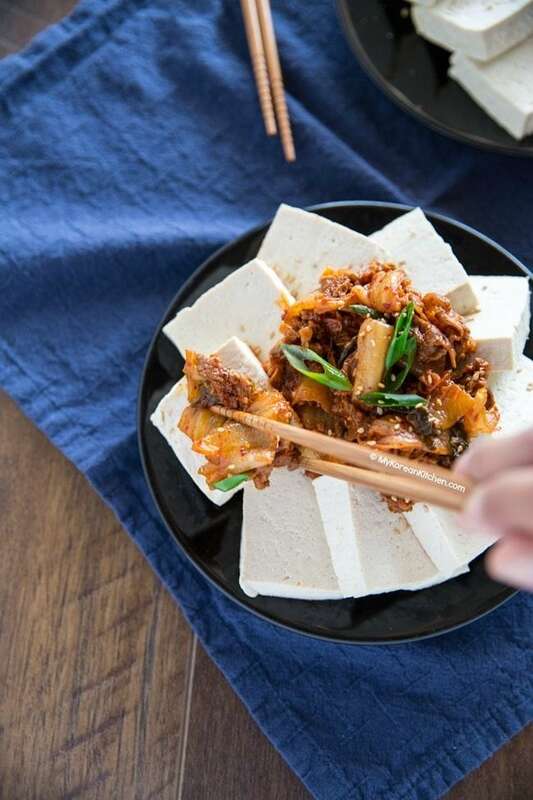 Serve the tofu and stir fried kimchi with pork on a large plate. Enjoy while still warm. It can be reheated in a microwave. 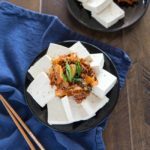 A popular Korean side dish - Tofu Kimchi (Dubu Kimchi) recipe. In a well heated skillet/wok, add some cooking oil. Add the marinated meat and cook it on medium high heat until about 70% of the meat is cooked (3 to 5 mins). Add the kimchi and sugar and stir them well until the kimchi is fully cooked and tender (3 to 5 mins). Add the sesame oil, sesame seeds, and green onion and stir quickly. Remove from the heat. (Ideally, this step should start at the same time as step 1). Boil some water in a pot (enough to cover the tofu) and once the water is rolling boiling, add the tofu and cook it for 2 to 3 mins. Drain the water and thinly slice the tofu ( about 5 cm x 5 cm /2 inch x 2 inch). Watch out for hot steam or hot tofu while slicing. Tip: If you have a clean linen cloth (e.g. cheese cloth), wrap up the tofu with it before boiling. Then it’s easy to take it out while keeping the tofu shape in place. 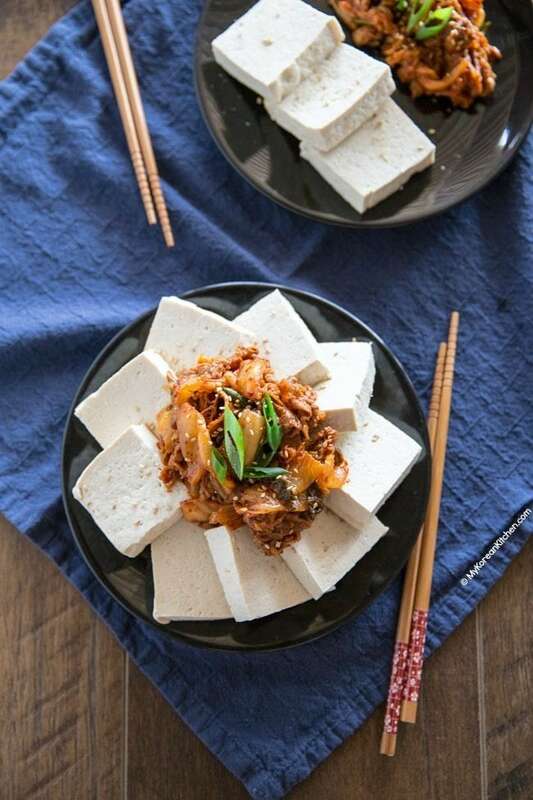 Serve the tofu and stir fried kimchi with pork on a large plate. Enjoy while still warm. It’s a simple and nice dish. My family all loved it. Is there a vegetarian version ? I sometimes make vegan kimchi by replacing fish sauce with soy sauce. Umami is not quite the same level, but it’s still good. Do you use soft tofu for this or firm? What is the reason for boiling it for 3 mins? It is to cook the tofu. For this dish particularly, tofu tastes better while it’s still warm. I know of two different types of “firm” tofu. One has the consistency of pudding/flan, and the other is more durable/crumbly. I use the crumbly “firm” tofu for most of my recipes, but I’m unsure of how to use the softer “firm” tofu. 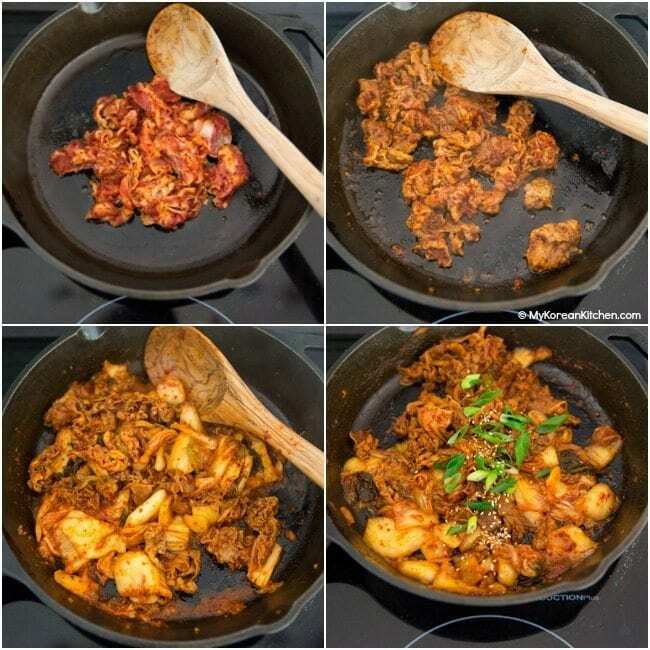 Which is used more in Korean dishes? wow nice lovely simply easily yummy….. ……i love it. I tried this dish before, but they serve with Bossum kimchi(i think thats a particular type of kimchi), its really nice! To me, i think its the kimchi that really stands out. It tasted different from normal kimchi that i had, n this one had oysters in it. I think tofu itself is quite bland. Its texture feels like a soft pudding yet I have met many westerners who didn’t like tofu. I did have a couple of particular brands I used when I was in Korea, but I haven’t had time to look for any in Australia yet. I will let you know if I find some good brands. Does Tofu taste like soybeans or is it bland? I’ve never been game to try it. Is there a particular brand that you use? I’ve heard on TV before that it’s best to use fresh tofu as it’s soft. Sue, What do you think? Mmmm. . . I just made this the other night as a side dish. I used pork belly, though. Not the healthiest but my husband LOVES it. I would like to try your vegetarian version. Just with tuna instead of pork is quite good.The fish soaks up a lot of flavour and you can still taste the sesame seeds and oil. Think I’ll try this meat-free version though.